There are not enough power pellets in the world to make this show watchable. Remember all those years ago, when it seemed like the whole world was in love with a roly-poly, compulsive eater caught in the throes of a prescription drug addiction? Haunted by ghostly manifestations of his paranoia, this poor soul was trapped like a rat in a cage as he attempted to maneuver the metaphorical maze of life. 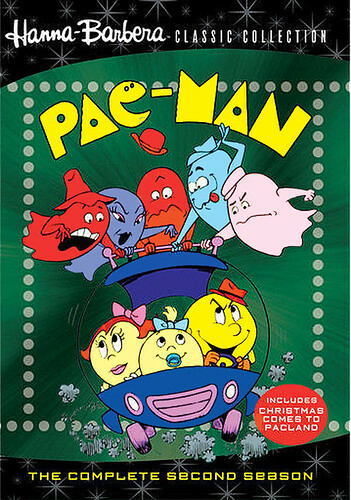 The existentialist nightmare of Pac-Man was popular enough to spawn several sequel games and even an animated series, which lasted two miserable seasons. Now, thanks to Warner Archives’ Manufacture-on-Demand program, both seasons of the atrocity known as Pac-Man: The Animated Series are available for home viewing. A perfect gift for nostalgic gamers and anyone who watched Midnight Express and thought “Hey, that looks like a swell vacation!” Pac-Man: The Complete Second Season includes 16 half-hour episodes as well as the holiday special, “Christmas Comes to Pac-Land”, which is somewhat notable for the fact that Peter Cullen provides the voice of Santa Claus. The idea that Optimus Prime and Santa Claus have the same voice is like a shining beacon of light in the pitch black field of feces and raw sewage that is this series, and the only worthwhile aspect of this collection. In no way, shape, or form should that be interpreted as me advocating your purchase of this series; it’s just kinda neat, that’s all. Y’know, Optimus Claus. That’s pretty cool, right? Making matters even worse, this season features the introduction of two new characters to the Pac-Universe: Super-Pac and Pac-Man’s high school dropout nephew, P.J. And if you were wondering, the answer is yes, P.J. stands for “Pac Junior,” which doesn’t really make sense, since P.J. is Pac-Man’s nephew, not his child. Then again, when seemingly every person, place, or thing in Pac-Land has some variation of “Pac” in their name, it shouldn’t come as much of a surprise. Hell, the baby’s name is “Pac Baby”…seriously! The bulbous denizens of Pac-Land were so unoriginal (or perhaps, so spaced out on the copious amounts of power pellets they ingested), they didn’t even bother to come up with actual names for their children. Anyway, back to Super-Pac and P.J. Their inclusion in this show is the animated equivalent of Cousin Oliver jumping a shark tank on a motorcycle. ‘Nuff said. Typically, I can find something nice to say about nearly anything I review. There’s always some nugget of entertainment in even the most miserable movie or a certain demographic that even the worst television program will appeal to. With that in mind, I offer this: my four-year old daughter found Pac-Man to be an absolute treat. That said, by the time the half-hour episode (which felt as thought it took approximately five hours to watch) was over, she was none too eager to watch another one. No, that joy was reserved for her father, the selfless and possibly masochistic reviewer of the best and worst that animation has to offer. In the end, the one nice thing I can say about Pac-Man: The Complete Second Season is that Optimus Prime provides the voice of Santa Claus in a show that even a four-year-old can’t stomach for any great length of time. Folks, if you’re feeling the onset of a nostalgic Pac-Attack, just play the game. Unlike the animated series, it still holds up after all these years.